The details of the foundation design that I use. 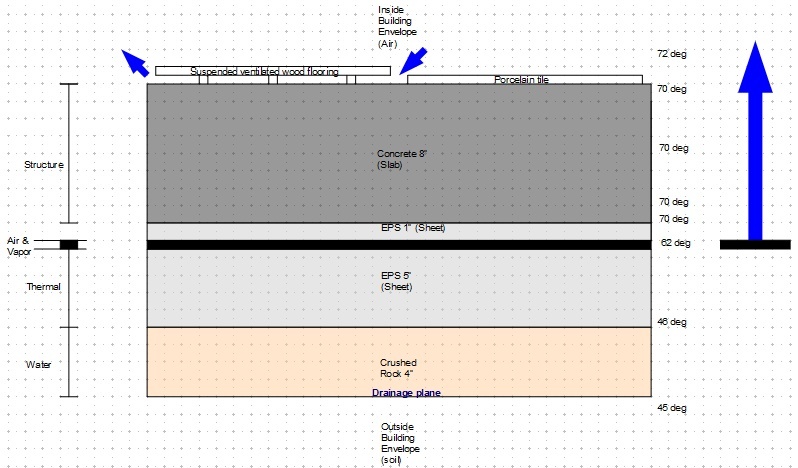 The top level building science on foundation design is covered on a previous page. The foundation design uses a mono-pour slab and footings, ie the slab and the footings are all one continuous piece of concrete. This is nice because it means the slab can contribute towards distributing the weight of the house into the soil. But we don't want too much of the house weight taken by the slab or else the slab could start to bow up in the center. The slab is not as strong as the footings. We want to arrange things such that 75% of the house weight is taken by the footings and only 25% is taken by the slab. In fact the weight that is taken by the slab wants to be mainly in the edge of the slab that is adjacent to the footings because this is best able to resist bowing up. The control mechanism for how much weight is taken by which parts of the foundation concrete is to vary the amount of deflection in the polystyrene (EPS) sheet that is under all of the foundation. Reducing the thickness of the polystyrene will reduce the deflection, as of course will be varying the PSI (Pounds per Square Inch) spec on the EPS sheeting. 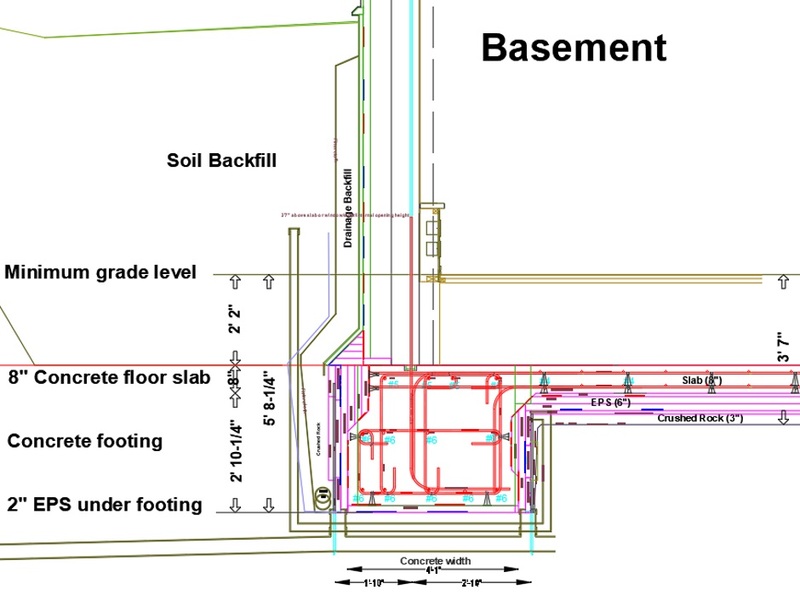 Under the footings we want less thickness and a higher PSI than the EPS that is under the slab area. Under the footings will be 2 inches of 40 psi EPS. Under the edge of the slab (adjacent to the footings) will be 6 inches of 40 psi EPS. This will compress three times as much as the footings so takes less force. 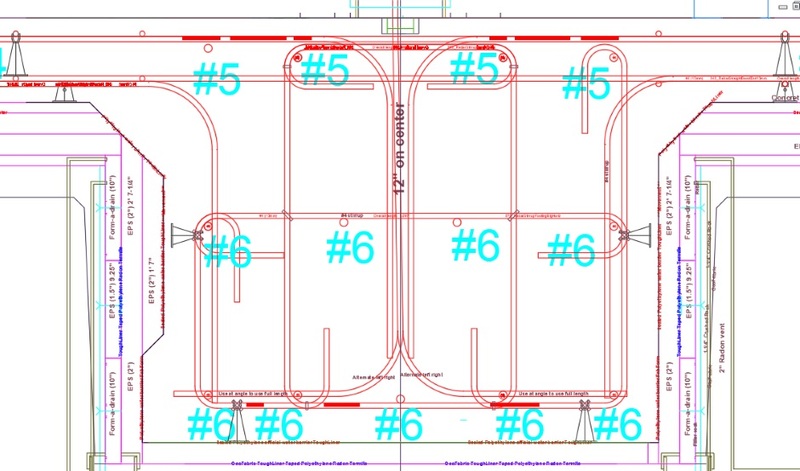 In the center of the slab it will be 4 inches of 15 psi EPS and 2" of 40psi EPS. The 1" EPS top and bottom is always 40psi but the psi of the two 2" sheets varies. The EPS is in sheets and the sheets are staggered to cover the joins. The 2" 40psi EPS over the slab will be 2 foot and 4 foot sheets round the outside (adjacent to the footings) and from then on 15psi EPS will be used. 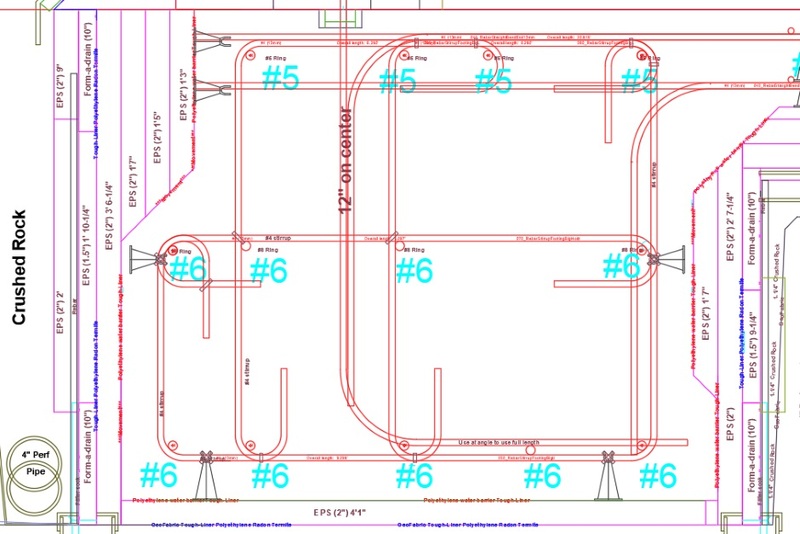 This means only a 2 foot wide strip adjacent to the footings will be pure 40psi EPS. The next 2 feet will be half 40psi and half 15psi. And the rest of the 2" sheets to the center of the slab area will be pure 15psi.